Marketers have a lot to figure out these days. They need to navigate between decisions about how much to focus on personalization versus brand marketing, determine what data they need for each, and how it will be acquired, analyzed, and utilized, and decide which marketing technology components they need to choreograph to support their goals. And all the while they need to ensure they will be improving the customer experience. This session includes two presentations looking at the role of data in overall marketing strategy and customer experience. Wednesday, November 29: 10:30 a.m. – 11:30 a.m. The Early Bird price for the Gilbane Conference ends this Friday, November 3rd. 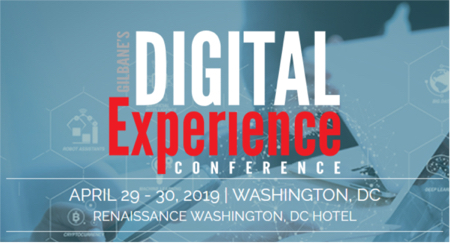 The Gilbane Digital Content Conference is focused on content and digital experience technologies and strategies for marketing, publishing, and the workplace. Join us as a speaker, but hurry! We’re building the program for our annual Boston conference in the next few weeks and want to make sure you have the opportunity to apply to be a speaker. As a speaker you’ll be addressing our influential community of content management, digital marketing, and technology experts and practitioners. Join us to educate, learn, and network. We are proud of our speakers and promote them as a key benefit of the conference. The deadline for proposals is Friday June 2, 2017! The Fairmont Copley Plaza is the official conference hotel for the Gilbane Digital Content Conference 2016. The following discounted guest room rates (plus applicable taxes) have been arranged for attendees who book by November 11, 2016. Please note that the discounted room block is subject to availability and therefore is not guaranteed. So, please book early! As a special consideration for our attendees, the discounted group rate includes complementary in-room WIFI. Reservations can be made online at https://resweb.passkey.com/go/gilbaneconf2016. Or, to make a reservation by phone please call the Fairmont Global Reservation Centre at 1-800-441-1414. Be sure to mention you will be attending the Gilbane Conference in Boston so you receive the discounted group rate. Are you focused on customer experience and digital marketing? September 10, 2016 / cdurrell / Comments Off on Are you focused on customer experience and digital marketing? Have we got a track for you at this year’s Gilbane Conference. Track C: Content, Marketing, and Customer Experience is designed for marketers, marketing technologists, social marketers, content strategists, web content managers, content marketers, content creators and designers, and business and technology strategists focused on customer experience and digital marketing. Register now to join us for the Gilbane Digital Content Conference’s Track C: Content, Marketing, and Customer Experience on November 29-30. Get a full description for all 14 sessions in this track, here. Join us at the Gilbane Conference in Boston December 1-3 and learn how your peers are building superior digital experiences for customers and employees. Personalization is a big, and complex, component of customer experiences. A successful strategy for your organization needs to consider all the stakeholders and lots of variables. This workshop will help you begin, or review, your personalization strategy. In this workshop, we will discuss the thinking necessary to build a strong personalization strategy for any organization. Illuminating a range of different types of strategy and effective scenarios for different organization types, we will pull back the details to understand the commonalities, decision paths, and frameworks for organizing these strategies. For attendees, the workshop will provide both an overview of this complex subject, and the chance to discuss their own challenges and align them with strategies that can work. This workshop is included in the ConferencePlus package. Save $200 on the ConferencePlus and Conference Only options. To get your Bluebill discount use priority code 200BB when registering online. Join us at the Gilbane Conference in Boston December 1-3 and learn how your peers are building superior digital experiences for customers and employees. If you haven’t reviewed your analytics for effectiveness in a while, or are wondering if you are collecting the right metrics to support your business objectives, this in-depth workshop is for you. For digital innovators, Analytics and data-driven decision-making have become key determinants of success. “If you can measure it, you can manage it.” The right metrics often make the difference between monetizing innovation and under-performance. Yet identifying these “metrics that matter” isn’t easy—the right metrics vary widely based on your business model—nor is it easy to build the required capabilities and collecting the necessary data. Fortunately there is a way to make it easier, and this presentation will share a better way to tackle the challenge. In this workshop, author and analytics veteran Jaime Fitzgerald will share his battle-tested method that addresses this challenge. During two decades working with data, Mr. Fitzgerald created a new method that makes it easier to define the metrics you really need to monetize your innovative ideas, business models, and initiatives. In addition to defining the “metrics that matter,” Mr. Fitzgerald’s methodology defines the analytic methods and data sources you need to generate these key performance indicators, and how they will be used to enhance key business decisions, essential processes, and business model evolution. Join us at the Gilbane Conference in Boston December 1-3 and learn how your peers are building superior digital experiences for customers and employees. If you have a website refresh project coming up, make sure you are prepared with the latest info on the web content management technology landscape by attending this in-depth workshop. If you are a website or intranet manager or architect, this year may well find you looking to implement new tools or refresh dated platforms. However, you face a wide and growing array of vendors willing to address your problems. Which ones offer the best fit for your particular circumstances? How can you quickly distinguish among the 120 major toolsets across these marketplaces? How are changes in the open source landscape impacting your options today and going forward? Where does Web Publishing intersect with emergent technologies? What should you expect to pay for these tools? What are the critical, can’t-ignore architectural distinctions you need to make? How can you insure that your selection process meets your original business objectives? Which should you pick first: Agency, Integrator, Vendor, or…? What are some major pitfalls others have made that you can readily avoid? How are these marketplaces likely to evolve in the coming years, and how can you best align your firm to take advantage of future innovation? This workshop is included in the ConferencePlus package. Save $200 on the ConferencePlus and Conference Only options. To get your Bluebill discount use priority code 200BB when registering online. Join us at the Gilbane Conference in Boston December 1-3 and learn how your peers are transforming their marketing operations to support superior digital experiences for customers and employees. If you have a project coming up make sure you can measure your before and after results. Learn how by attending this in-depth workshop. Marketing management has never been so exciting — or daunting. The proliferation of digital tactics and lightweight technology has cleared the path for us to take genuine ownership of our operations, and be less reliant on other areas of the organization to do our jobs. While this new reality is empowering, it also comes with challenges. Indeed, today’s senior marketing manager is not only tasked with traditional responsibilities such as brand shepherding and lead generation, but also line items such as data analysis, technology portfolio optimization, and vendor relations. To survive and thrive in this environment, it’s become increasingly important for us to measure performance using a systems-oriented approach. In this workshop, attendees will learn how to assess their digital marketing operations in entirety, and identify opportunities for improvement and costs savings. While the core of this workshop will rely on referencing an actual case study, it will also be interactive, with attendee company assessments worked into the session. Join us at the Gilbane Conference in Boston December 1-3 and learn how your peers are building superior digital experiences for customers and employees. If you have a project coming up make sure you have the right service provider partners by attending this in-depth workshop. We provide a step-by-step overview of an efficient, results-driven selection program, and we show you how to build a messaging and communications plan that will help you shape internal conversations about it. With this approach, you can set expectations, educate reluctant stakeholders, and get your company thinking about change management, which is often an afterthought but shouldn’t be. The selection process is all about aligning business goals with the “best-fit” partner for your organization’s needs. And finding that fit is about way more than just ticking the boxes of a procurement process checklist. Armed with the outcomes of this workshop, you will be ready to move forward with confidence and find the right service provide to partner with on your customer experience journey.